And we thought we were busy before! Over the holiday weekend, Ashley’s dad came up and so did Jacob, a friend of David’s. We had a long weekend of building on David’s new cabin. Luckily, the weather cooperated for the most part. 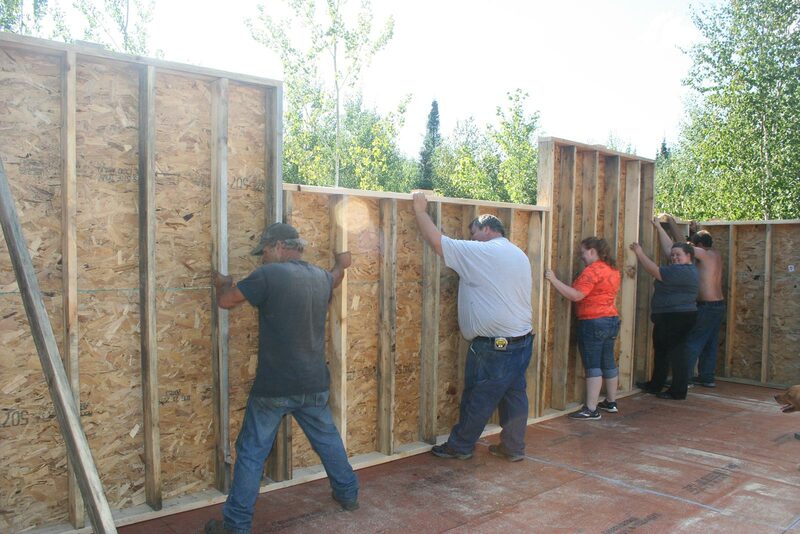 Not only did David and Troy get the stairway to the second floor built (Friday evening), but all of the walls flew together and on Sunday, the rafters began to be set into place. David is hurrying to get the cabin dried in before snowfall, the windows aren’t being framed in so that makes things go much faster, but will result in more work on down the pike. We tease David about his cabin being so high he needs lights on top to keep planes from hitting it. Standing up the 28-foot wall on the second floor. Things did slow down as David wanted to put three shed dormers on the second floor, two in front and one in back. This changes the angle and measurements of the birdsmouth in the rafters so they’ll have to switch back and forth as more rafters go into place. By Sunday afternoon, the rafters were beginning to get set up. Meanwhile (back at the ranch! 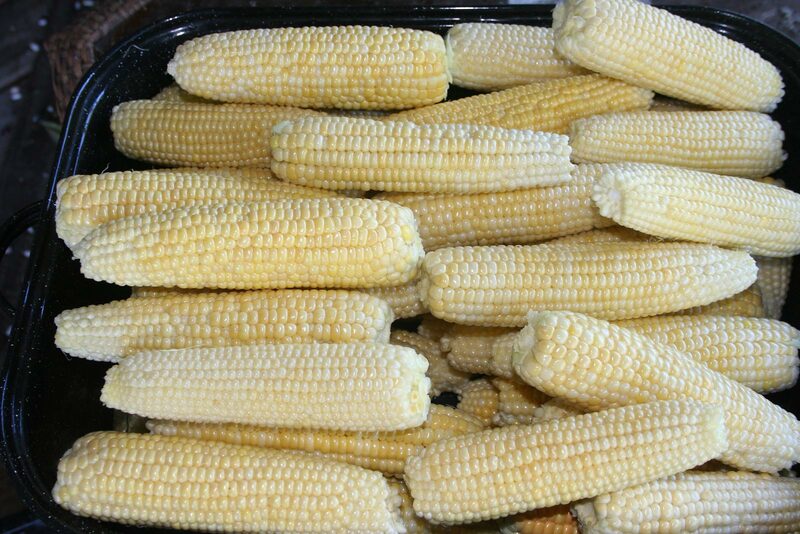 ), I’ve been bush picking and canning sweet corn like mad. Yesterday I did a big batch of corn with sweet red peppers. We like a variety in our foods so I can the corn with sweet peppers, plain sweet corn, corn salsa, corn with peas and carrots, and corn relish too. Today, it’s corn with peas and carrots. (As our peas are all dry seeds now, I add frozen peas, thawed, to the mix and this works just fine. We have lots of carrots! Two five-gallon buckets of fresh sweet corn equals a big pan full, ready to cut off the cob and can. I cringed when I listened to the weather radio this morning; they’re calling for possible “frost in low-lying areas” and “scattered frost.” EEEKkkk! We have way too much to cover, we’ll have to cover what we can and pray like mad. (You can add yours too!) We need all the help we can get to keep that dreaded frost away from our gardens. My pantry shelves were getting more than full so Will brought in some lumber and while I ran to town for tractor hydraulic fluid, he put up two more big shelves. And he carried down the boxes of canned foods I’d already put up. (Because of my bad knee, I have a hard time carrying boxes down the stairs. I can do a few at a time, then have to rest the knee.) Now they’re all down there until I can up more corn. The bottom shelf is the new one Will built in the pantry. Now I have to fill it up! Wow! Things sure have been hopping at your homestead. 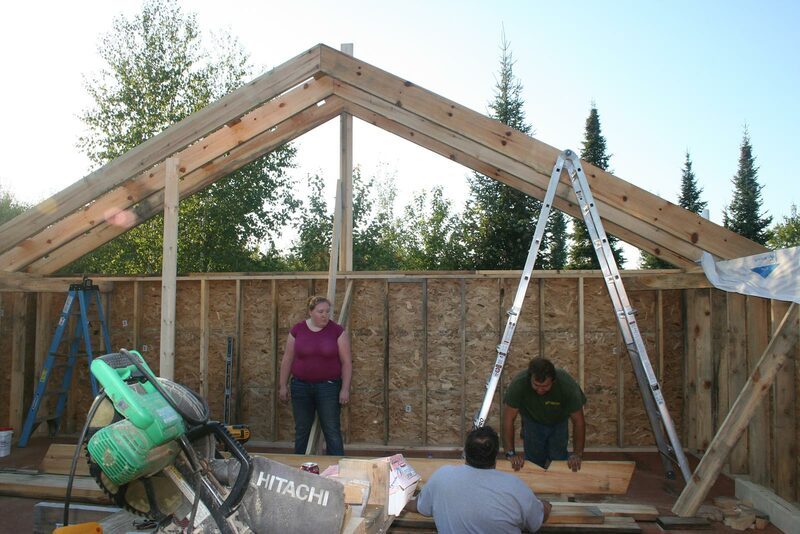 So glad that David’s cabin has made such progress. I’ll bet you’re all very excited to see that happening. Wonderful to see all the canning you’re getting done. Busy here in Michigan doing the same! Yep, we’re hoping David can get is cabin under a roof and dried in before snow hits. And boy are we ever canning! So thankful for such a good garden and harvest this year!!! Signs of a early winter around here too. Aspens turning wayyy early and the garden went into overdrive. Both signs of a early winter. All I can say is Eeekkkk! I’m not ready. Yet. Always great to read your blogs. Have you ever experienced the Freeze Dried foods? Do you have any idea of what to look for in the different machines available? Can the freeze dried foods be stored in canning jars, zip lock bags? Just thought I would ask you before looking for info. else where. Presently canning up a storm from the garden. I’d love a freeze dryer! Just can’t afford one. Boo hoo. They do make an excellent quality storage food that retains color and nutrition as well as flavor. I’d like one to save room in our pantry which is stuffed. 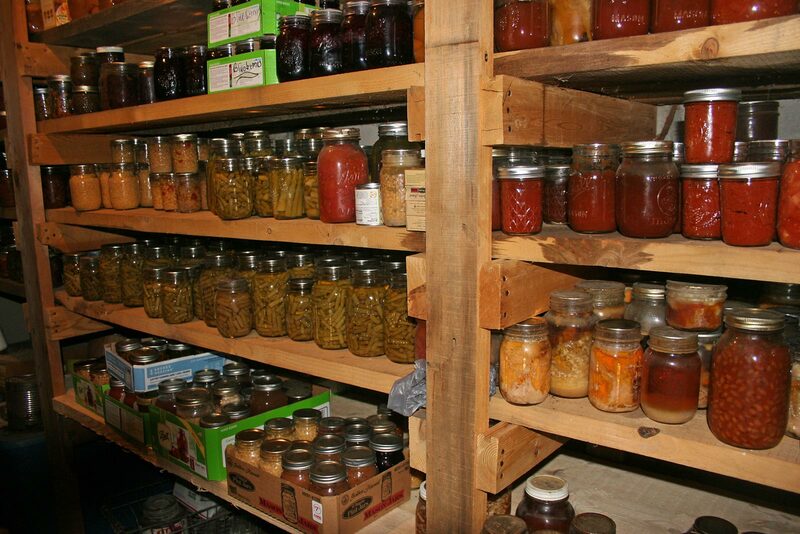 You should store your freeze dried food in airtight cans or jars to prevent moisture or insect/rodent damage. You are so smart in this crazy food storage world. How would freeze dried food save room in the pantry if I am still using cans? Is there a shrinkage? Love to read about your adventures! I’ve read your blog since 2007, but never commented. Feel like family, and check your weather with mine. Had to leave my beloved log cabin behind, but seeing yours and David’s helps. Thanks for all you’ve taught me about canning and just life. Any news from Pastor Rick? Miss his cheerful comments too. Planning my seed order already. No, I haven’t heard from Pastor Rick and I’m really worried. I miss him too! And I’ll be so relieved if I hear everything’s okay with his family. Yep, we’re already planning on what we’ll plant next year and our this year’s harvest isn’t all in yet! Jackie, you do such great work! I get tired just reading it all! Lol! I get tired, doing it! But I do enjoy it, really. It’s like having fifty hobbies! The big pumkin at the Alaska State Fair was over 1400pounds. There was a picture in the Anchorage paper of it being moved with a fork lift! I asume that they raised it in a green house using all the tricks with the advantage of a some what warmer climate than here in the Copper Basin. I have all I can do to get a few winter squash in a hoop house. We have had frost on the cars three times but not hard enough to kill the potatoes and all the sensitive stuff is in the green house and two hoop houses which I heated with tank top propane heaters when it hit 35. Your sons house is coming good. My eldest son with his sisters help is working on a “tiny house” on one of our lots. They have it dried in and hope to have it habitable by winter. Is your helper coming back or is she done for the year. Yep, a 1,400 pound pumpkin is way out of our league! But ours is still growing because David and I covered the plant with a big quilt. Our hoop houses survived with no heat but we’ll have to heat soon to keep them going longer. Our potato vines are pretty much toast but there’s still some green on them so…..
We’ve heard from Alisha regularly and hope she’ll be back with us in a couple of weeks. Love that girl and miss her cheerful, go-get-’em attitude! The canned food looks great. The homestead we are living on is my new DIL’s. When her husband left (because she became a Christian) she had to go back to teaching and the huge gardens and green houses laid bare as she just could only handle a little in the green houses by herself. It has laid un-farmed for almost 7 years. The last two week-ends we have been clearing salt bush from around the fenced garden with a Bobcat and this week-end they worked on the fence. We also have a good amount of fruit on the apple, pear and peach trees. I have canned peaches two days ago. Picked more yesterday and they are on the table with a thin flour sack dish cloths over them. We have pack rats and so have to pick the fruit a bit early so they do not carry it off. We live in the high desert of AZ. Thanks so much for this site. I enjoy watching all the progress you make there. Hopefully next year the green houses at least will be planted. Congratulations on all you have accomplished. Sounds like you’re making great progress! Keep up the good work. Oh, Jackie! You have been busy! That would wear me out, & Im only 66. I had not realized you all were so far north. We are way south of you in North Alabama. We fought the blight on tomatoes this year. Lost all my Cherokee Purple, and Polish tomatoes. Found unknown breed of tomato seeds and we are growing again. Although they have set fruit, But they may turn out to be hybrids. We will see.. Hope y’all stay healthy. Thank you, Peggy. Sorry you fought the blight this year. It’s a tough enemy, for sure. Better luck next growing season.